Morning pickup is available from downtown Boston hotels if pre-arranged at time of booking. Otherwise, meet in downtown Boston and hop aboard a luxury air-conditioned coach for a comfortable, scenic ride north through North Shore, the region between Boston and New Hampshire. Soak up views of the rocky coastline dotted with marshes, wetlands, beaches and harbors. Your guide will explain why this is an important historical, cultural and economic region of Massachusetts. Visit Hampton Beach in New Hampshire for a brief stop to stretch your legs and a look at the Atlantic shoreline from the sands of this popular summer destination. After Labor Day, this stop will be a drive by and a visit to the famous Stonewall Kitchens will be added. Afterward, continue your journey along the coast to Maine. 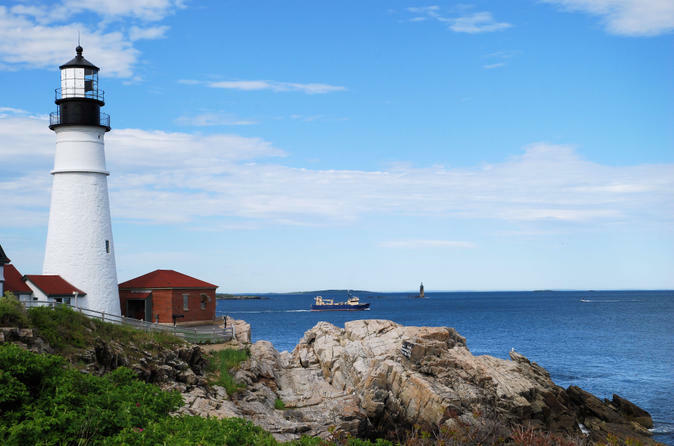 Your next stop is Nubble Light, formally known as the Cape Neddick Lighthouse. Located on Cape Neddick near entrance to York River, this 19th-century lighthouse is a famous American icon and a classic example of a picturesque lighthouse, so be sure to snap some photos! Stop in the town of Kennebunkport for free time to enjoy lunch on your own at one of the many eateries featuring all kinds of fresh seafood. After lunch, browse the shops and enjoy Kennebunk's charming tree-lined streets showcase typical 18th- and 19th-century architecture constructed by merchants and sea captains. You’ll also drive by Walker Point to view President Bush's summer home before returning to Boston. This tour is seasonal and only operates from May to October.